Transbronchial vs Transesophageal Needle Aspiration Using an Ultrasound Bronchoscope for the Diagnosis of Mediastinal Lesions: A Randomized Study. Oki M, Saka H, Ando M, Tsuboi R, Nakahata M, Oka S, Kogure Y, Kitagawa C. Chest. 2015 May 1;147(5):1259-66. Response to Crizotinib and Clinical Outcome in ALK-Rearranged Pulmonary Pleomorphic Carcinoma. Murakami Y, Saka H, Oki M. J Thorac Oncol. 2015 May;10(5):e28-9. The role of smoking status on the progression-free survival of non-small cell lung cancer patients harboring activating epidermal growth factor receptor (EGFR) mutations receiving first-line EGFR tyrosine kinase inhibitor versus platinum doublet chemotherapy: a meta-analysis of prospective randomized trials. Hasegawa Y, Ando M, Maemondo M, Yamamoto S, Isa S, Saka H, Kubo A, Kawaguchi T, Takada M, Rosell R, Kurata T, Ou SH. Oncologist. 2015 Mar;20(3):307-15. Randomized phase III trial comparing weekly docetaxel plus cisplatin versus docetaxel monotherapy every 3 weeks in elderly patients with advanced non-small-cell lung cancer: the intergroup trial JCOG0803/WJOG4307L. Abe T, Takeda K, Ohe Y, Kudoh S, Ichinose Y, Okamoto H, Yamamoto N, Yoshioka H, Minato K, Sawa T, Iwamoto Y, Saka H, Mizusawa J, Shibata T, Nakamura S, Ando M, Yokoyama A, Nakagawa K, Saijo N, Tamura T. J Clin Oncol. 2015 Feb 20;33(6):575-81. Feasibility and accuracy of molecular testing in specimens obtained with small biopsy forceps: comparison with the results of surgical specimens. Oki M, Yatabe Y, Saka H, Kitagawa C, Kogure Y, Ichihara S, Moritani S. Respiration. 2015;89(3):235-42. Phase II study of erlotinib for previously treated patients with EGFR wild-type non-small-cell lung cancer, following EGFR mutation status reevaluation with the Scorpion Amplified Refractory Mutation System. Morise M, Taniguchi H, Saka H, Shindoh J, Suzuki R, Kojima E, Hase T, Ando M, Kondo M, Saito H, Hasegawa Y. Mol Clin Oncol. 2014 Nov;2(6):991-996. Current status and future perspectives of cooperative study groups for lung cancer in Japan. Kawano Y, Okamoto I, Fukuda H, Ohe Y, Nakamura S, Nakagawa K, Hotta K, Kiura K, Takiguchi Y, Saka H, Okamoto H, Takayama K, Semba H, Kobayashi K, Kenmotsu H, Tsuboi M, Yamamoto N, Nukiwa T, Nakanishi Y. Respir Investig. 2014 Nov;52(6):339-47. Endoscopic ultrasound-guided fine needle aspiration and endobronchial ultrasound-guided transbronchial needle aspiration: Are two better than one in mediastinal staging of non-small cell lung cancer? Oki M, Saka H, Ando M, Kitagawa C, Kogure Y, Seki Y. J Thorac Cardiovasc Surg. 2014 Oct;148(4):1169-77. Varenicline is more effective in attenuating weight gain than nicotine patch 12 months after the end of smoking cessation therapy: an observational study in Japan. Taniguchi C, Tanaka H, Nakamura N, Saka H, Oze I, Ito H, Tachibana K, Tokoro A, Nozaki Y, Nakamichi N, Sakakibara H. Nicotine Tob Res. 2014 Jul;16(7):1026-9. Randomized phase III trial of erlotinib versus docetaxel as second- or third-line therapy in patients with advanced non-small-cell lung cancer: Docetaxel and Erlotinib Lung Cancer Trial (DELTA). Kawaguchi T, Ando M, Asami K, Okano Y, Fukuda M, Nakagawa H, Ibata H, Kozuki T, Endo T, Tamura A, Kamimura M, Sakamoto K, Yoshimi M, Soejima Y, Tomizawa Y, Isa S, Takada M, Saka H, Kubo A. J Clin Oncol. 2014 Jun 20;32(18):1902-8. Cefepime monotherapy for febrile neutropenia in patients with lung cancer. 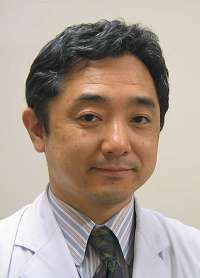 Saito H, Takahashi K, Okuno M, Saka H, Imaizumi K, Hasegawa Y, Tanikawa Y, Yamamoto M, Taniguchi H, Shindoh J, Suzuki R, Shimokata K; Central Japan Lung Study Group. J Infect Chemother. 2014 Jun;20(6):365-9. Endobronchial ultrasound-guided transbronchial needle aspiration in the diagnosis of small cell lung cancer. Murakami Y, Oki M, Saka H, Kitagawa C, Kogure Y, Ryuge M, Tsuboi R, Oka S, Nakahata M, Funahashi Y, Hori K, Ise Y, Ichihara S, Moritani S. Respir Investig. 2014 May;52(3):173-8.